Let's break the ice and talk about your first approach to recording. What was your first song you recorded? Could you tell us about your songwriting and recording process? It's from my first Ep, titled “It's true”. The song is called “She knows”. I had written some songs before that, but I wasn't really serious about recording until six months before I recorded that album. I've been writing songs pretty much the same way as when I started, which is starting with a chord progression, and then improvising melody and lyrics over that, then just editing from there. I always record when I'm improvising so that I can go back and listen. It's always ideal if I don't change the melody too much because I feel that when I try to change too much it becomes less sincere and genuine, it loses something. When did you find out that writing songs and living off music was your path through life? It took me a while to figure it out, I put out my first two albums and then I took a three-year break in between. Looking back, I wasn't sure if I could do it, but there was always something missing when I wasn't doing it, so I think that helped me find my way back to it. I was working full-time at a day job and writing music for a while, until I moved in Seattle. The company I worked for, which was based in San Diego, told me that I needed to move back in the city, otherwise I couldn't keep my job. I didn't feel like moving back, and at that point, I said I'll just try and live off music. That was about two and a half years ago, so I've been doing music full time since then. Tell us about “Overflow”, your most recent album. How was it born? I actually started writing songs for the album right when I quit my job. At that time, I also had to move out of my apartment. There was a lot of uncertainty and chaos in my life, so I think the record was born out of this feeling of being overwhelmed with everything changing and nothing being certain, and just trying to find meaning and some kind of beauty and truth in that. Do you think the actual US political situation somehow inspired your songwriting? Not yet, because it all happened so recently and we recorded this album almost a year ago. Probably for the next one! You were born in Harbin, China, then you moved and grew up in California. 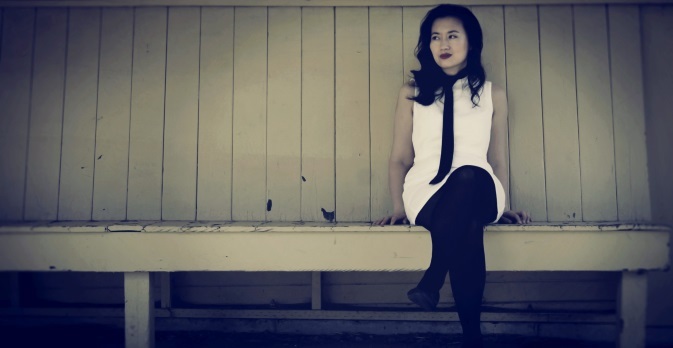 Do you think being a first-generation immigrant influenced somehow the way you write music? I don't know if this has to deal with that, but I spoke Chinese at home growing up so English wasn't my first language. However, when I write I focus more on the melody than the lyrics because I think that in my songs the truth lies in the melody. When I've tried to learn languages, like German and French, in school, their cadences and rhythm really interested me. There is a certain cadence in every language. There's however something universal, an undercurrent that transcends language and countries. I think it's mostly subconscious, but when I write music I try to get in touch with that kind of undercurrent life. By the way, I read that you have lent your talents for ACRS (Asian Counseling and Referral Service). Will you tell us what is that, why it's important, and what it deals with? It is an organization that supports the resettlement of immigrants of Asian descent in Seattle, and it provides a lot of different services. There's a food bank, it offers English language classes, mental health support, art classes. It also teaches people how to fill out forms, and everything that someone coming into the country will need in order to feel comfortable and to learn how to survive. It can be really challenging to adapt to the new cuisine, so it offers Asian meals for the immigrants that arrive. What are your most important musical and non-musical influences? As for musical influences, definitely Tori Amos and Aimee Mann. As for non-musical influences, actually I've been pretty inspired by Obama in the last few years. In particular, the way he has weathered so much criticism and hatred towards him but he remains calm and eloquent. Whenever you see him. I love the way you connected in your songwriting a more heterogeneous instrumentation to an absolutely remarkable atmospheric feeling. Where do you see yourself in your next album, speaking of sound and composition? I haven't decided either I'll go one of two directions. One is headed towards a very minimal, vocally-driven album and the other is for a more electronic one. Last question: your albums are self-released through crowdfunding. Any contacts from any label? Any label you'd like to work with in the future? I've had some offers from a few small labels but it didn't make sense to me to sign with them, because of what they were offering. I'd like to work with a few indie labels, like Sub Pop in Seattle. However, in talking with other indie artists, a lot of times it makes sense to remain independant instead of going with a label, because you pretty much have to be successful, have your own fanbase and a pretty established music career before a label even takes interest in you and offers you anything substantial. Even then, you're sacrificing artistic freedom for maybe not too much support. It's getting tougher to find labels to work with.